After having suffered two massive animal die-offs in as many days, there’s no doubt that the Arkansas Fish and Game Commission is working overtime. The research department already had a bunch on its plate as a result of the massive die-off of drum fish, then came the 5000 blackbirds and starlings that fell dead out of the sky. The mystery of the Arkansas dead bird shower has yet to be solved, though preliminary reports suggest that the 5000 or so dead birds found in Beebe, Arkansas, died of massive trauma akin to running into something like hail. “Further tests will be done to rule out other causes, but the birds suffered from acute physical trauma leading to internal hemorrhage and death. There was no sign of any chronic or infectious disease,” said Keith Stephens of the Arkansas Fish and Game Commission. The birds showed massive physical trauma in their breast tissue, with blood clots and internal bleeding; organs were otherwise normal. 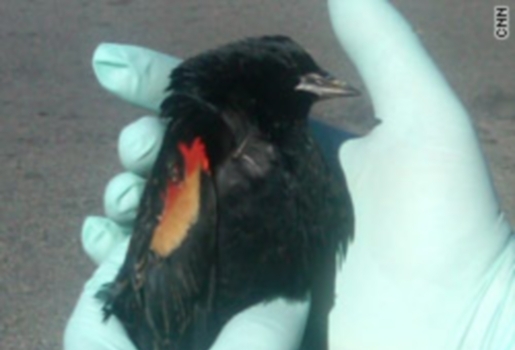 Interestingly enough, another 500 or so dead red-winged blackbirds, starlings, and grackles were discovered in the Louisiana town of Labarre. According to Jim LaCour, a veterinarian with the Louisiana Department of Wildlife and Fisheries, there was no immediate evidence of trauma. Blackbirds and starlings rarely, if ever, fly at night.